This article originally appeared on urbanOut in May 2010 and gained a lot of attention in the Columbus blogosphere so I figured it should be shared on Indy’s prominent urban blog as well. People love to compare cities and pit them against each other in an attempt to understand strengths and weaknesses of places, analyze overall regional urban patterns, and try to learn from other place’s successes and failures. One comparison I always hear, see, and read is between Indianapolis and Columbus, two cities that often get a ‘twin cities of the eastern Midwest’ tag. I find this characterization particularly interesting given that I have lived in both places for an extended period of time and have thus developed an understanding of each. While I completely appreciate this comparison, I can’t help but notice many dissimilarities as well, ultimately leading me to believe that Indianapolis and Columbus are twins on paper, yet opposites at their (urban) core. On top of this basic demographic data, other similarities exist, including the fact that both cities are capitals thriving in struggling states and blooming later than traditional powerhouse cities in the Midwest region, thus bucking the trend of the Rust Belt. Further, both feature similar transportation models with similar sized bypass highways, both intersected by I-70, both lacking rail transportation options, and both known for their dominant car-culture. Both regions also have a similar north-south divide, with the more prestigious, elite suburbs found on the north and the middle to lower-class suburbs found on the south. I could go on and on about other similar statistics and data (ie. each regions Hispanic population growth numbers are very comparable) but I think the point has been made: Columbus and Indianapolis, on paper, seem very similar and thus worthy of the comparison and scrutiny these two cities often face. Indianapolis – Strong downtown, overall weak neighborhoods, mainly single family, wood-frame, housing, very spread out (as a metro). Columbus – Weak downtown, overall strong neighborhoods, numerous brick-style row houses, relatively dense by Midwest standards (as a metro). On top of these physical disparities, I believe the two cities have different attitudes that ultimately manifest themselves in each cities respective urban core. Columbus has an urban spirit not found in Indianapolis, resulting in places like the Short North, German Village, Victorian Village, and Harrison West – all independent oriented, arts inspired urban neighborhoods that feel authentic, progressive, and on-the-go. Indianapolis’s core is centered on its CBD – a regional center that celebrates conventions, sports arenas, shopping malls, and more traditional dining options that appeal to a wider audience. Places like Mass Ave and Fountain Square do bring their own uniqueness to the table, but they lack a sense of sophistication, urban intellect, and cosmopolitan outlook found in Columbus’s core. And ultimately, these attitudinal differences make the urban experience in each city quite dissimilar and unique in their own right. There are a few reasons why I think these differences exist. First, Columbus has Ohio State, one of the nation’s largest universities and a significant source of energy and excitement towards progressive, urban-minded ideas and ways of life. Indianapolis has IUPUI and Butler, but each simply can’t compare to the size and strength of Ohio State. Second, Columbus has to compete with Cleveland and Cincinnati for attracting people, money, and resources, thus forcing them to ‘up their game’ and create neighborhoods that can compete with Mt. Adams or Clifton in Cincinnati and Ohio City or Tremont in Cleveland. Indianapolis has no such competition within the state. Third, Columbus’s gay and lesbian population is larger and more concentrated than in Indianapolis, providing a bigger population base that is more likely to live in urban cores. And fourth, Columbus is made up of a lot of ex-Clevelanders where Indianapolis has a large ex-Indiana rural population, providing Columbus a population base that is inherently more urban-minded. What I find most interesting about these differences outside of why they actually exist is what they mean for each regions future. It is my belief that these differences will ultimately prove to be a huge economic and social advantage to Columbus since the American population increasingly desires more urban, unique, and diverse neighborhoods. In time, I expect Columbus to overtake Indianapolis in population and in-migration growth numbers, erase the ‘on-paper’ similarities, and become a true Midwest standout city. Thanks Greg for the post, this is actually one of my favorite topics. Most of my family of from C-Bus and I spend a good bit of time over there. I love German Village, Victorian Village and the Short north and have always longed from those sorts of areas in Indy. If you’ve never been to Kansas City, I strongly recommend visiting b/c I feel that KC and Columbus have a lot more in common than Columbus and Indianapolis. I can’t see Columbus overtaking Indianapolis, Columbus has no downtown Urban structure. There’s no shopping, minimal entertainment, no reason to go downtown. But if you do go downtown you have to walk cerebral blocks in Wind and Rain and snow to get to where you want to. Parking is expensive, and it’s inconvenient. I am not sure if it’s smart to look at the past growth to predict future growth in population, but Columbus’ city popuation has been growing roughly twice as fast as Indy’s over the last 20 years. If that trend continues, then it’s clear they will overtake Indy in population. I always say Indy has a lot of untapped potential…IUPUI alone could propel future growth. Its enrollment is roughly 30k, and less than 5% of those people live on campus. It would be interesting to me if one you would cover that issue. Based on anecdotal evidence, I believe there is enough demand (and land) for more housing on IUPUI campus. Joe, Columbus has grown its population by a continuous program of annexation and not by downtown growth. Most of that “city” growth has been suburban subdivisions far from downtown, similar to Indianapolis’ growth from filling in the former outlying cornfields of Decatur and Franklin Townships. Again: more similar than not, except that Ohio law allows Columbus to continue annexation outside its home county but Indiana law restricts Unigov Indianapolis to the Marion County limits. Which pushes the suburbs even farther out. Very nice post, Greg. Having lived in both cities as well your summary really resonated. I can think of a few more similarities/differences between the two cities. You touched on what I consider to be the largest different between the two – what you’ve dubbed Columbus’s sense of urban spirit. Ask 10 folks from Indy where they live and you’re just as likely to get a response of a street intersection (16th and Delaware, 46th and College, etc.) as a neighborhood name – largely because Indianapolis lacks strong neighborhood identity. Ask 10 folks from Columbus, and most other Midwest metros, and residents will not hesitate to say their neighborhood (Short North, Grandview, Clintonville) because that is how residents in most places identify and affiliate themselves. One similarity that I think is underestimated is the two locales geography. Both are very flat with small ‘rivers’ immediately west of the urban core. This flat geography lends itself to uninterrupted street grids in both places – making for similar urban patterns. Many similarities and differences between the two cities can be summed up simply by taking a look at the ‘alpha’ street in both places.- Meridian in Indy and High in Columbus. Outside of being the most famous streets for their respective cities, both act as the primary N/S thoroughfare. That’s about where the similarities end. In Columbus, High St. is a true urban corridor with mostly continuous street walls and mixed-use continuity that extends for mile and miles – from the downtown, through dense urban neighborhoods, through campus, through more residential Clintonville. In Clintonville, however (5+ miles north of downtown), High St. still maintains a diverse set of uses. Meridian St. contains mainly large, monolithic commericial structures before it becomes almost exclusively residential – in each case the street is laregly single use. This in turn affects the walkability and vibrancy of the street as a whole. I definitely agree that the performance metrics can be a little misleading when comparing these particular cities. IUPUI until recently, had their hands tied by the mothership (IU) in regards to student housing. IU did not allow them to construct housing for any more than 3% of the student population. IU has now granted them permission to construct enough housing to support 10% of their student population. Expect to see a lot of plans coming forward from IUPUI in the coming months for some more traditional student housing. The campus currently only has one traditional residence hall. Not all of of Columbus’ elite suburbs are north. Bexley is due east of downtown on old Route 40. There is one surprising place where Indianapolis might be a little behind. Both cities have an interstate jumble downtown, with a busy one-mile shared leg. But overall Indy doesn’t have as much downtown freeway infrastructure (3/4 inner loop with 4 legs radiating out) as Columbus (seven legs radiate out from a complete inner loop, plus there is a southside crosstown link). Would less downtown freeway infrastructure put Indianapolis “behind?” I don’t think so. Not arguing against the main premise of the great post, just the reply following that suggests that downtown freeway infrastructure is one to put in the ‘plus’ column when comparing CBus and Indy. I meant that in a tongue-in-cheek way. That Indianapolis has less freeway infrastructure than Columbus (a similarly-sized city and metro) is a GOOD thing from an urbanist point of view. As a child, my parents took me to Central Market (the old “public market”) in Columbus. It was demolished in the 60’s to build a downtown interstate. Despite the continuous record of failure of Indy’s City Market through the last two decades, we still have the building and the opportunity to argue over what to do with it. Thanks for the reply Chris. Hopefully my tone wasn’t tsk tsking. Just found the post really interesting and wanted to chime in having lived in both Indy and Columbus (Worthington Village). There are apparently a lot of us who have lived in both places. I was born in Columbus and have deep roots there…including German ancestors who lived in German Village when it really was that. Nice reply Bob. I think a complete inner belt is a plus for Columbus. I opens the near west neighborhoods (Grandview) to the rest of the city. I have also lived in both Indianapolis and Columbus. I was born in Columbus and moved to Indianapolis when I was five. I then went back to Columbus to attend Ohio State for graduate school. I would agree with a lot of what your post claims. Ohio State is a major advantage for Columbus over Indianapolis. There is a real connection between OSU students and the surrounding area of the city. That helps to make the Short North, Victorian Village, and Clintonville such great neighborhoods with unique commercial and residential. IUPUI does not seem to have that same connection to Indianapolis. It will be very interesting to see if that can develop more and more with time. It will also be interesting if Butler could become a more significant presence in the city. Even though I believe that Columbus is more advanced with respect to its urban identity, I do believe that Indy is moving in the right direction. Fountain Square is kind of the flash point I believe for the arts, progressive, urban living in this city. I think the continued development and improvement of Fountain Square will provide a positive example to other neighborhoods within Indianapolis to create more of a connection to their neighborhoods by connecting pedestrians to a wide array of options. I like both cities, and I think both Indianapolis and Columbus are moving in a good direction (but they both desperately need light rail options). Great post. I think, like any comparative article, it obviously helps to have a frame of reference. Mine is that I have not spent a ton of time in Columbus, but have spent some time there. I worked for a company with an office in The Brewery District and then would spend time at OSU. I didn’t care for the Brewery District too much, but I think my frame of reference was office hours and it felt, obviously, a little empty. I imagine its pretty great in non-office hours. It would be amazing if Indy had something more than a commuter campus downtown, or if Butler grew some to strengthen the Midtown area. Before comparing to Indy, I was always disappointed in OSU, mainly comparing it to other Big Ten campuses (again, being comparative). But, when compared to IUPUI… well, its pretty amazing. I think both cities will do well in the coming decade. The thing I do worry about for Indy is the mentality that once a neighborhood or district is on its feet, we move on and focus on these totally impossible situations for neighborhood turnaround. It seems like people think that Broad Ripple, Mass Ave, Fountain Square, etc… are good enough now and we should spread the love to more downtrodden areas. Reality says that the canal in Broad Ripple should be amazing, but is totally gross and mired in surface parking, Mass Ave still has a good clip of surface parking and many new totally vacuous buildings (though its supposed to be hip), and Fountain Square has been about to turn the corner for fifteen years (or more?) We need to focus on getting the places that are close all the way there. Another fear is the focus on neighborhoods in general for Columbus. I could be way off here, because I don’t know Columbus that well. However, a lot of currently great neighborhoods are made up of fairly built out areas with historic assets. These historic assets, however, somewhat dictate that future density will not increase, unless there is available land. Midtown will suffer from this. Anything tall is seen as an outcast, but they want to have successful retail. It is hard for retail to survive with a low population density unless it is very focused. Midtown wants its nodes, and its single-family homes… oh, and nothing taller than one or two stories. Regardless, both cities need to improve. Neither is a great city – lets all work hard to change that this decade. Well i feel like Columbus oh have more land then indy, Columbus oh Franklin county is bigger then Monroe county. Indianapolis is in Marion County not Monroe County. Monroe County is where Bloomington is located, so you need to get your facts straight before you post on here. I’m not going to hush when I know people are making ignorant comments without knowing their facts. If you can’t handle that then you shouldn’t be posting here. As someone who likes neither, I’ll give you my two cents. 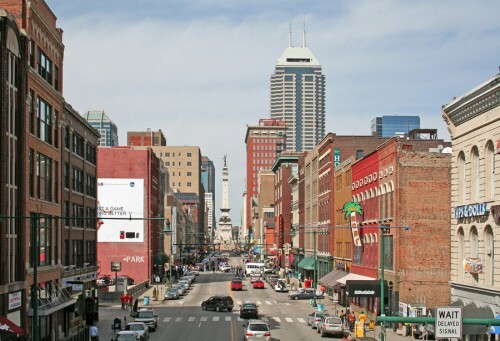 Downtown Indy is far and away larger and more cosmopolitan than Columbus. Columbus is anchored by a college, whereas Indy is anchored by professional sports. Columbus sort of has a hockey team, which nobody watches and has a futbol team which also nobody watches. Both are flat and ugly as sin. People in Columbus refer to neighborhoods, whereas Hoosiers refer to the street corners. I’m not sure why some people think this distinction is important. You say “tomaato,” i say “tomahto.” neither really has interesting distinct neighborhoods like a Chicago, SF, NYC, etc. You could sleep walk across Broad Ripple, its so tiny. But for my money, and as a sports fan, nobody puts on a better sporting event than Indy. Which is why it continues to host final fours, super bowls, etc. Its also noted as the amateur sports capital, and for good reason. fantastic venues for a myriad of sports. Columbus does get the edge in the “sophistication” department, I suppose. And really, this is like comparing a failing student to one with a D-. Lots of rural people flock to both cities. Its sort of the general rule that if you are from Indy or Columbus, you move to Chicago after graduation. and if you are from a Dayton or Ft. Wayne, you move to Columbus and Indy respectively. If I had to move to the midwest, I would still prefer Chicago, despite the crime, cost of living, traffic, etc. Its just simply a “real” city. Okay, thanks. We bumpkins continue to be in thrall of Chicago. And you as well. Chris it’s funny how you say people leave Indianapolis and Columbus for Chicago. If that’s the case then why have Indy and CBus been two of the few Midwestern cities that consistently grow in population every decade, whereas Chicago (excluding the 1990s) lost population every decade since the 1950s? For you to say that a person could “sleep walk across Broad Ripple” just tells me how foolish you really are. Broad Ripple has a vast array of bars, restaurants, and beautiful houses as well. B.R. is a very popular tourist attraction, so is Fountain Square for that matter. For Indianapolis and Columbus to show such a consistent amount of growth in population, in a region not known for having consistent population growth makes these cities special. Cities like Chicago should take a note from Indy and CBus on how to attract people into it’s city limits, and keep luring in more and more people to keep the population from sliding. Chicago is a “real city” but so is Indianapolis and Columbus for that matter. If they weren’t they wouldn’t have their own metropolitan area, nor would they have their own skylines either. Indy and CBus wouldn’t have so many businesses, restaurants, bars, and tourist attractions that make them the attractive, beautiful, wonderful cities that they are if they weren’t real cities. Don’t think that I’m discrediting Chicago in any way because I think Chicago is a beautiful, stunning, gorgeous city in it’s own right. The point that I’m trying to make is that Indianapolis and Columbus deserve recognition too. Like it or not Indy and CBus look like they’re going to be the future cities of the Midwest, that is if they’re not already considered the future cities of the Midwest. Ok, I gotta say, maybe just tone it down a little, you’re letting your fanboy-ness cloud your opinion. indianapolis (and cbus) are not real cities, cbus is a real town, definitely, but indianapolis is essentially a giant suburb with a couple tall buildings in the middle. The “urban” core is only like 4 blocks wide. and as for brip and FS being tourist attractions, i’d say that’s only true for indy and the surrounding areas as well as college towns, but wouldn’t consider it an attraction compared to millenium park, michigan ave etc. and chicago is losing population because it’s expensive and areas have high crime. Indianapolis is cheap as hell and there are jobs here (because it’s cheap as hell) that’s why Indy is growing, cbus grows because it’s the perfect little town, it also has a solid job provider (cummins). Columbus is a town done right. Indianapolis has a loooong way to go before it’s a city. chicago is great but they are indeed sliding downward… a bit. i like indy, and i’m invested in it but it’s not comparable. I’m not going to tone it down as you put it because what I say is a matter of fact, and not just a matter of opinion. It’s funny how you say I’m a fanboy yet you say Columbus is a real city and not Indianapolis. They are both cities and not giant suburbs as you called Indy. Could it be that maybe you’re being too much of a fanboy of CBus and that you’re more biased in favor of that city then you are of Indianapolis? Just so you know there is more than a “couple of tall buildings” in Indy. The tallest skyscraper in Indianapolis (Chase Tower 811 feet) is taller than the tallest skyscraper in Columbus (Rhodes State Office Tower 629 feet.) Indy grows every decade because like CBus, Indianapolis benefits from being the state capitol with all the high paying government jobs. That’s the main reason Indy and CBus consistently grow every decade because of low poverty, and low unemployment compared to other Midwestern cities. I do realize Indianapolis is one of the most inexpensive U.S. cities to live in (so is Columbus for that matter. )However to say that jobs are here “because it’s cheap as hell” is just an ignorant thing to say. I never was trying to compare Indianapolis or Columbus to Chicago. I do realize that neither Indy nor CBus will ever be as world renowned as Chicago. Chicago will always be the alpha city of the Midwest, much the way New York City has always been the alpha city of the Northeast, and Los Angeles has always been the alpha city of the West Coast. The only point I was trying to make is that there’s more to the Midwest than Chicago. Cities like Indianapolis, Columbus, Kansas City, Minneapolis deserve recognition as well. Even Omaha I think has its appeal as well. Now if you want to talk about a city that looks like a giant suburb, you should see what Omaha and Wichita look like. Those two cities have the most unimpressive skylines out of any Midwestern cities I’ve seen. Omaha and Wichita’s downtowns look very empty and desolate as well. Even though I consider Omaha very suburban looking, I have to say I was very impressed by how beautiful and how well maintained the houses in Omaha looked. Omaha has low unemployment and low poverty like Indy and CBus, which would explain why that city keeps growing in population every decade. scratch that i just realized you were talking about columbus ohio, i would totally agree that columbus ohio is a real city and all that. disregard cbus related statements in my comment. I would say that columbus and cincinnati have beat indianapolis in almost every way, i like indy but if I could choose, i would choose to live in cincy or cbus. indy is too low rise and the antithesis of dense, it has too many people with a mindset that everything should be a suburb but also in the city, they are also obsessed with being able to drive and park EVERYWHERE which is not conducive to a healthy city. Indy and it’s population are also far too cheap. They’d rather do something fast and cheap and deal with problems later than do it right the first time and save themselves money in the long run. There’s so much about this city that is frustrating but I’m still working to improve it, investing in this city in the hopes that one day it’ll be able to compete with cincy and cbus. Oh yes Cincinnati has got Indianapolis beat alright, its crime and poverty rates certainly beat Indy’s. Indianapolis has already got Cincy beat with better jobs and better incomes. But hey if you want to say that one of the Rust Belt cities has got one of the shining stars of the Midwest beat, then I guess your entitled to your opinion. When Cincinnati becomes smaller in population than Lincoln and Fort Wayne, I’m sure you’ll say that Cincy is still better than them because it’s denser right? Actually, Cincinnati is quite growing. We were estimated to have about 297,000 people within the city limits in 2015. That’s more than it was in the 2010 census. And yes, Cincinnati is more denser and even more urban than Indy and even Columbus. We beat CBUS in metro population. While Indy and Columbus have metro populations at about a million,We have a metro of two million, twice the size of the two cities. Cleveland leads Ohio with the biggest metro, yet it has less population than CBus and Indy and is smaller in size. Indy consolidated its county to Unigov in the 1970s while Columbus annexes suburbs where soccer moms live outside Franklin County so nobody is moving into the urban cores. True, jobs are more abundant in the OSU land and the grid of suburbia, but Cincinnati is no longer a rust belt town. Like Cbus Cincinnati has diverse populations and a sense of community that wasn’t seen a decade before, but we have that urban charm that sure blows Columbus out of the water. We’re older and more established than Indy and Cbus, so is Cleveland. Celebrities move here, we have more to do than go to a colts game, and we are currently building a rail system in our city core…. Which is more glitzy and glamorous than the other two’s, even if you put them next to each other side by side. A 9-year thread: what is the consensus, now?